Opening Eyes to New Iris Introductions. The year was 2008 and it seems every year I fall in love with a new iris, especially if I attend the American Iris Society National Convention for the year. This year was no exception as the new iris to catch my eye was ‘Have A Goodun’ by Tom Burseen. What did this iris have over the hundreds of other cultivars and seedlings? It had presence. With an average stalk and height, compared with others around it, no matter the garden, ‘Have A Goodun’ caught you and drug you across the garden to look at it. Was it perfect? Well no, but it had that X-factor for me that I had to have it. Since that fateful day I received ‘Have A Goodun’ for my collection I was impressed. Within two months of planting two rhizomes I had ten increases and by spring I had enough to produce 8 stalks. No matter where or how I used it in hybridizing I got a pod with greater than normal number of seeds. While other tall bearded iris fell in the heavy down pours, I lost a flower or two from ‘Have A Goodun’. With the heat and humidity of summer and the onslaught of leaf spot ‘Have A Goodun’ was barely affected for I had put sand around it thinking it was from Texas and needed the extra drainage. Whatever the reason this is an iris that will stay in my collect for many years to come. I have learned from this experience it just might be better to spend that money on new introductions as they come available for the improvements in color and disease resistance. 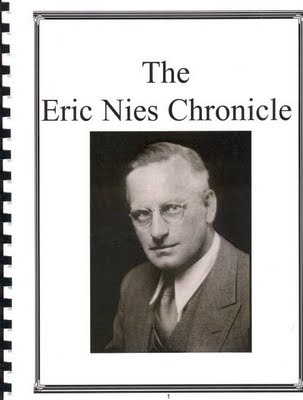 Being a lover of Spuria irises, I finally picked up the booklet The Eric Nies Chronicle, published by the American Iris Society, compiled and written by Mr. Nies’ granddaughter, Nancy Nies. What a wonderful collection of stories and life experiences about someone so recognizable, but yet very much unknown to iris lovers of my generation. Reading it gave me a sense of loss in a way, for the great man, and for the inability to say, “Mr. Nies, I have a question for you about those Spurias you created.” How many other early manipulators of iris genes (artists, really) were out there, whose dedicated lives are lost, except in the memory of early American gardeners (few of whom) are still with us? One of the most surprising pieces of information about Eric Nies is that he lived and created his irises right here in my town, Los Angeles. Secondly, what came to mind while reading this Chronicle is, why is it that Spurias have not taken off in popularity given the amount of work and dedication from early hybridizers? I don’t really know. Eric Nies was born in 1884 at Saugatuck, Michigan, and was one of thirteen children. His parents were immigrants from Holland. In 1913 he moves with his family to Los Angeles. He starts his hybridizing work in 1920 (what about this year, that so many important events start surfacing in the world). As a supervisor of an elementary school’s agricultural center in Los Angeles, Mr. Nies first comes into contact with Spuria irises. I was also happy to read that as late as 2002 the Nies/Walker Spuria cultivar, ‘Driftwood’ received the Royal Horticultural Society’s Award of Garden Merit. Ironically, the American Iris Society awarded the Hybridizer’s Medal to Eric Nies in 1952. He never knew he had received it though since he died in January of the same year. Hope these few glimpses of this pioneer of our iris world will inspire you to read more about him or earlier iris hybridizers. Information about The Eric Nies Chronicle may be found through the Spuria Iris Society. Other Historic Chronicles may be obtained from the Historic Iris Preservation Society. Note 1: I could not find original pictures of Eric Nies introductions. If you have any, would share them with us? Thank you. Note 2: For AIS history buffs: The only time an AIS National Convention was held in Los Angeles, was in 1956. First off, I'm so thrilled that The American Iris Society finally has a blog! Kudos to Andi Rivarola for leading up this effort to produce snappy, free content on behalf of the world's largest organization of iris lovers. If you belong to the AIS, you've probably seen my name atop the masthead of Irises, our Society's official magazine. Feel free to drop me an email about anything iris- or magazine-related at editor@irises.org. I'm always in search of the next great iris story to tell. With any luck that story might just grow in your own backyard or take place at your local club's next event. Don't be a stranger! I plan to use my posts to preview upcoming content in Irises and solicit your input. I'll try to drop hints about cover stories, headlines, and give updates about the status of the issue as it works its way through the publishing process. The AIS needs as much feedback from our membership as possible now more than ever. So here's a teaser for the upcoming April issue... interested in all the new color breaks coming along in Siberians? Hybridizing masters Marty Schafer and Jan Sacks have authored a tremendously colorful article full of some mouth-watering photos of Siberian seedlings coming out of superior varieties like 'Humors of Whiskey' (2007), pictured below, courtesy of Brock Heilman. I don’t know about you, but ever since I started growing irises it’s been my dream to grow as many types of irises as I could. I specially like MTBs (Miniature Tall Bearded), Species, Louisiana and Siberian irises. I have tried to grow these over the years, but with a lot of difficulty in my Southern California garden. I wish I could grow more. I was in a daze when I saw Miniature Tall Bearded iris ‘Sailor’s Dream’ (Kenneth Fisher, R. 2004) at the Portland’s 2006 National Convention of the American Iris Society. It was blooming profusely at every site I visited, it had healthy leaves, and the color was extremely nice – a deep wisteria blue that really caught my eye. As Portland was my first National Convention, I was making excuses to the other closing-program dinner guests on why I voted for ‘Sailor’s Dream’ to win the Franklin Cook Medal Cup. “Very rarely,” they said, “would a MTB win.” Anyway, we all laughed about it, but to my surprise and that of the other dinner guests ‘Sailor’s Dream’ won The Franklin Cook Memorial Cup for 2006. That the iris I voted for won this award was an unbelievable feeling. Upon returning home I ordered it immediately, but to this day it has never bloomed. Still, this story is not really about ‘Sailor’s Dream,’ (I like to believe that some day it will bloom so I still grow it) it is about the other MTBs I grow and which bloom every year. Is there a scientific reason why they bloom in my area? If there’s one, I don’t really know. I only know that everyone else tells me they don’t suppose to. So, here are the MTBs that do well: ‘Monty Duane’ (Wyss 2000); ‘Missus Bee’ (Bunnell 2003); ‘Bangles’ (Lynda Miller 1995); ‘Ozark Dream’ (Fisher 1992) and ‘Little Bay Denoc’ (Fred Williams 1978). Proud to grow them in Los Angeles, where they don’t suppose to grow. Next time, I will tell you about the Siberian irises that don’t suppose to grow in my area either. Note 1: From The American Iris Society: The Franklin Cook Memorial Cup is awarded annually during The American Iris Society’s national meeting. All introduced irises seen growing and in bloom in the official tour gardens of the meeting are eligible for the Cook Memorial Cup, except irises originated within the host region for that year’s national meeting or originated by a hybridizer whose garden is included on the official garden tour, regardless of its location. Irises considered need not be an official "Guest" iris. Each registrant may vote for only one variety and the Franklin Cook Memorial Cup is awarded to the iris receiving the greatest number of votes. Note 2: Sailor’s Dream has earned the following American Iris Society Awards: Honorable Mention 2006; Award of Merit 2008, Williamson-White Medal, 2010. With THINK SPRING (MTB 2003) by Stephanie Markham we start a new adventure with you all -- The Blog of the American Iris Society. With our senses beginning to feel Spring, and the hope of a new opportunity to see the beauty around our gardens once again, my hope is also that you will join us regularly to view posts by our blogging contributors, and to share your notes and ask questions about our loved plant/flower, the iris. Here's a description of iris that someone contributed recently, and that I like a lot: History and Meaning of Iris: Latin for 'Rainbow.' Dating back to Greek mythology, primary meanings include faith, hope, wisdom, courage, and admiration. The iris' history is rich, dating back to Ancient Greek times when the Greek Goddess Iris, the messenger of the gods and the personification of the rainbow, acted as the link between heaven and earth. Purple irises were planted over the graves of women to summon the Goddess to guide the dead in their journey. Ancient Egyptian kings marveled in the iris's exotic nature, and drawings have been found of the flower in a number of Egyptian palaces. During the Middle Ages, the meaning of irises became linked to the French monarchy, and the Fleur-de-lis eventually became the recognized national symbol of France.